Who is Rajilad? To find out, you need to read book 3 in author Alan Wallach’s adventure series Kieran Cummerford. 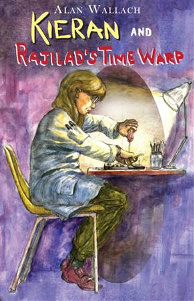 Kieran and Rajilad’s Time Warp is a tale about the genius from Pimglammam and her pathway into the past. Buy the book now or read it free on wattpad.com. Kieran stood in front of his class with his notes on the desk in front of him. He was just finishing a presentation on the history of the city of Philadelphia for his extra credit term paper in social studies. Mr. Meyer, his teacher was listening intently. There were things in the presentation that he certainly did not get from a history book. How did he know about Caspartown which is nowhere on the current maps. Where did he find out about what was on a menu in a diner in Caspartown in colonial days. Or did he make all that up. It sounded too realistic to be fiction. When he finished, Mr. Meyer looked at him. Just then the bell rang and Kieran thought it had saved him. He was wrong. He picked up his backpack and social studies note book, excused himself because he had another class and started to rush off. A photo, which was in his notebook, fell out of it and onto the floor. As he bent down to pick it up, Mr. Meyer saw it and took it out of his hand. “May I see that?” Kieran, with a worried look on his face, handed it to Mr. Meyer. Mr. Meyer studied it and thought he recognized the two men with Kieran. He turned the picture over, read what was written on the back and laughed. “How did you get this photo?” Mr. Meyer asked with another chuckle under his breath. Kieran reacted coolly. “It was a joke. I’m real good with Photoshop,” he said, reaching for the photo. Mr. Meyer handed it to him.